I recently attended TEDx Asheville. Side note: If you aren’t familiar with TED talks, they are short presentations focused on “ideas worth spreading.” Here are two of my favorite running related talks. At this TEDx event, Bernie DeKoven shared his thoughts on play, and how as adults, we’re removed from the playfulness of our childhood that once created so much joy. As we get older, it’s only natural to become less playful because our minds shift to more important things. Family, work, and grown-up responsibilities all come before play. Wasn’t life more fun when play was the #1 priority? When it comes to running, we fall into that same trap. To test out my theory, I decided to actually ask the world (or at least my followers) via Twitter. Here’s what you said. A fantastic reason to run (they all were), and honestly, if I responded to a tweet like that, I’m sure I would have said something similar. But out of the 12 people who responded, only two mentioned enjoyment, and one of those people listed it as her third reason. You may know that I’m a co-host on Matt Frazier’s No Meat Athlete Radio podcast. Each week, I head over to his house to record the next episode. We set up our computers and microphones, pull our our notepads, and get serious about talking on whatever subject we picked for that week. Often, we’re interrupted by the footsteps of one of his kids running around upstairs. Sometimes we stop, sometimes we just keep going. Sometimes he looks annoyed, and sometimes I do too. Most of the time we just have to laugh at the situation. All the time, though, I feel a sense of joy from hearing their small feet pattering on the floor as they run down the hall with excitement. As we sit there, trying to record a quality episode on some serious running or nutrition topic, it’s the playfulness of a 4 year old that reminds us just what running is all about. 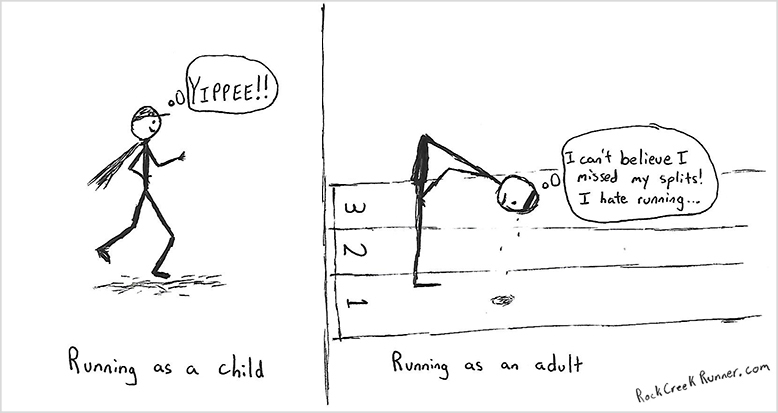 From a young age, most of us spent tons of time running. We’d run through the yard playing tag, or along the trail dodging the trees. We’d jump off rocks and pretend to be super heroes. Running wasn’t about splits and PRs, it was an act of play. Somewhere along the line, however, most of us lose that tie between running and play. We begin focusing on our pace and counting miles. We follow strict plans and force ourselves to run workouts even though we’ve been dreading them for weeks. We do these things because we want to get better, become stronger, and run longer. We’re pushing to be our best selves. And to do that, it requires dedication and pain. And it requires us to, at least in part, turn what was once play into something more serious. The more serious and disciplined we are about an activity, the more we improve. That’s a good thing. The problem is that when we cut out the fun, we gradually begin to dread that activity, and eventually we end up quitting it all together. Looking good feels nice. Crossing the finish line is rewarding. But when it takes months of hard work to get there, and I’m not enjoying the process, my training becomes unsustainable. Anything worth doing should be challenging, but it should also be enjoyable. The more we can associate a difficult activity like running with enjoyment, the more likely we are to stick to it and actually crave to get out on our next run. In other words, the more fun we have running, the more we’ll want to run. For most runners, running doesn’t, and probably shouldn’t, be all play all the time. But it should remain enjoyable. To do that, we need to harness our inner child and bring back some of the elements of play we once associated with running. Just like when we were younger, running should fun. “But Doug! I can’t just run around play tag every evening.” Well you could, but you probably won’t find many people to join you. Instead, turn what you’re already doing into something playful. 1) Run trails: Almost every time I finish up a trail run, I think, “man, that was a blast!” Having fun doesn’t mean it didn’t hurt or that it was easy, it just means I had a good time. Jumping over roots and downed trees, splashing through creeks, and launching off rocks. When I get in the zone, the trail becomes my arcade game, and nothing can keep me from winning. I like to call this the “fun zone,” and I know I’m not alone in feeling it. 2) Run with someone else: Some training partners push you to new limits, while others make you feel like you’re just out hanging with a buddy. If you can, find one that does both. Did you know that we work 12-15% harder when training with a partner? Running with someone else not only makes things more fun, but will also push you further. 3) Turn your run into an adventure: It doesn’t matter if you’re on the road or the trail, make your next run an adventure. Explore new trails and run up new mountains. Design your route to go through a new neighborhood or to discover a new part of town. You never know what you’ll see or discover on your run. That’s the beauty of an adventure. 4) Mix up your workouts: As a coach, I love assigning workouts to people that they’ve never done before. It keeps things fresh and challenges them in new ways. It’s also a lot of fun. Even if the workout is a tough one, doing something new can be playful and bring joy. Ask around and find new workouts or drills that you’ve never done before, or just make a point to mix it up every week. This keeps you from getting stuck in a rut. 5) Make your run a game: Get creative! Turn your run into some sort of game or challenge. My favorite is to run the curb. Instead of running on the sidewalk or street, I’ll go blocks at a time trying to run strictly on the curb. Not only is it fun and challenging, it’s also a good way to gain balance and practice intentional foot placement. Don’t like that one? Try not stepping on cracks, or only landing on rocks. The beauty is that you can play these games and a passerby will never know. My point here isn’t to tell you that serious training is bad. After all, that would be terrible for business. What I want is for runners to begin bringing playfulness back into their serious training. Whether that’s through fun on the trails, laughter with running partners, or exploring new areas, make fun just as big a part of your running and mile splits. It’s through that joy and play that we’ll be more motivated to tackle big goals and push the boundaries of what we consider impossible. It’s the play that will keep us coming back for more. So will you join me? Will you bring back the play? I know the feeling! It’s hard for me to sign up for a road race these days. But they can be fun too! As a Pastor and a runner I see this lack of play in life a lot. The way I explain it to others and why I’m called a “crazy preacher” is this: in the eyes of God, we are all children! Since God was never born and will never die, (He always was, is and will be), and since God created us to be His Children, we are always kids in God’s eyes, no matter our physical age. We need to enjoy ourselves a bit more in this crazy, upside down environment we call Earth. I am so pleased to be a part of the running community because I see us enjoying ourselves more than many others going through this adventure we call life! I’m glad you’re finding play in the running community, Dean! It sure is an adventure. Love this post! I’m bordering on that line between wanting to BQ (badly) but feeling tired & burned out with the training requirements. I want to be in shape, feel good, run fast. But a lot of days I dread working out. So this post is extremely timely. I need to inject some fun. Great! Good luck with the BQ. You can do it! I am thrilled to find myself a part of this post. What you say here about running as play could save people’s lives. And their playful souls. Thanks Bernie! I loved your talk, and hope I represented your points properly. Great post! I especially liked the “Little Story” part. As the father of two children (one in his early teens and the other not far behind) I’ve had these same thoughts many times myself. But, now that they’re getting older, they’d rather hang out with their friends than play with their old man. So I hadn’t had these thoughts in awhile and, while I was reading, the words started getting a little blurry. I realized I was getting misty eyed! Way to go Doug! I ran the Scenic City trail marathon in 2013 and haven’t done much trail running since, if any. But you reminded me how fun it was to train for that marathon. So I’ve decided that after the road half i’m going to do in Hilton Head this week, I’m going to get back out on the trails. Thanks so much for this post! Thanks for reading, Naren! Good luck and Hilton Head, and have fun on the trails! That sounds like a fantastic group! I’ll have to check it out. Keep it up! Douglass—I enjoy your blog a lot and I’m proud of your artistic talent. Keep up your excellent encouraging articles.